Professor Rafael loves Computer Graphics. Its favourite activity is rendering objects, specially dolls. But he does not like to draw regular polygons using triangles. 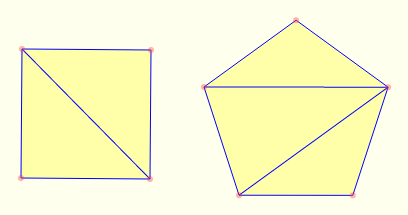 This task is done by composing a regular polygon using only triangles, in such a way that the triangles do not intercept each other and the minimum number of them are used in this composition. In the picture below you can see a square and a pentagon with its triangles. Professor Rafael asked you to calculate the minimum number of triangles necessary to compose a N-sided regular polygon. The input is a single number N (3 ≤ N ≤ 109), indicating the number of sides of a regular polygon. The output is the minimum number of triangles necessary to compose an N-sided regular polygon.